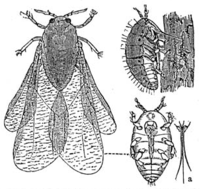 Phylloxera vaxtratis, a tiny insect related to aphids that feeds on the sap of vine roots, hit Porrera in 1893. Before the end of the century, not a single vine was left in the Priorat. An insignificant-looking though devastating grub put paid in no time at all to a wine that already by that time had acquired international prestige. In 1893, there were 17,000 hectares of vineyards in the Priorat. Practically not one single vine was saved and, worst of all, the Priorat proved incapable of recovering from the disaster. Emigration was a relentless phenomenon that lasted an entire century. While other wine growing areas in Europe managed to overcome the crisis, no resurgence took place in the Priorat. "It was then that the exodus from the country to the city began. Towns and villages that had once been cheerful and prosperous became depressed and neglected to the point that in some more houses than people remained", we learn from an article published in the Catalan journal Esplai in 1934.